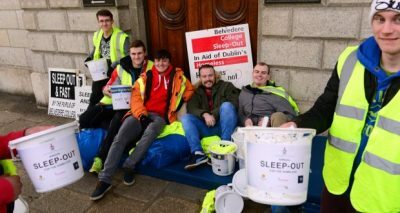 More than 80 students, teachers, past pupils and parents from Belvedere College are taking part in the school’s annual Christmas sleep-out in aid of homeless charities. The fundraiser began on Saturday and continues until Christmas Eve. It the 35th year that the school has held a sleep-out at the GPO on Dublin’s O’Connell Street and College Green. The first one took place in 1983. Fifth and sixth year students are seeking donations for Focus Ireland, the Peter McVerry Trust and Home Again. The Peter McVerry Trust is a charity set up by Jesuit Fr Peter McVerry to reduce homelessness and the harm caused by drug misuse and social disadvantage. Focus Ireland helps prevent families, young people and individuals from experiencing homelessness. The charity supports those at risk of homelessness and seeks to minimise the risk, by providing tenancy supports. Home Again provides residential care for children that is as close as possible to a family home. Last year, Belvedere’s sleep-out raised almost €200,000 for homeless charities. But with one family becoming homeless every eight hours in Dublin, the students are fighting an uphill battle. Some of the students participating in this year’s fundraiser spoke to Jesuit communications manager, Pat Coyle, about their involvement last Christmas’s initiative. Speaking about the homelessness crisis and the work that some Belvedere students do, meeting people on the streets, and offering them food and a chat, Harry Hamlet McGuire explained that when they do go on the streets they keep in mind the words of Brother Eamonn Davis SJ. “He tells us that when we go down to meet the homeless that we don’t stand over people… We’re sitting down and kneeling next to them and we’re having a conversation with them… and we’re getting to know them,” Harry said. One of this year’s organisers, Cormac Yalloway, said he was hopeful the students could raise as much as last year. You can donate at the website. Follow the sleep-out on Facebook, Twitter and Instagram.